The COSMOS-AzTEC-1 can form stars thousand times faster than the Milky Way, leaving astronomers puzzled. New telescopic images have revealed how the ancient Galaxy, COSMOS-AzTEC-1, can form stars thousand times faster than the Milky Way does. What the images received from the ALMA observatory say about the higher star forming rate of this ancient galaxy is that it is the presence of huge amounts of molecular gas with enormous potential of collapsing which makes the formation of new stars possible. The COSMOS-AzTEC-1 is a starburst galaxy and a very ancient one. A starburst galaxy is one that can have a star forming capacity much higher than what is observed in other galaxies. This galaxy was formed when the universe was less than two billion years old. The Big Bang which started the Universe was approximately 14 billion years ago. For a galaxy as old as this one, it shouldn’t likely be a fast star former, according to the standard theories of cosmology. Therefore, this discovery has the astronomers puzzled about the COSMOS-AzTEC-1. Normally inside a galaxy, the new star formation rate is kept under a balance by two opposing forces. The outward radiation pressure of the stars and inward pull due to gravity of the gases. Basically, the inward gravity pull is counterbalanced by the outward radiation forces and this restricts the star formation, keeping a balance. 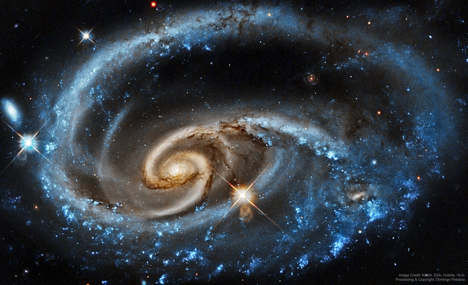 A galaxy can be thought of as a collection of stars, dust, and gases held together by gravitational pulls. Stars are formed when clouds and gases collapse due to own gravitational pull. In case of the COSMOS-AzTEC-1, the inward gravity pull is so strong that the outward radiation force proves to be very feeble to hold the star formation in check. Thus, in this galaxy, the star forming process evades the clutches of restrictive measures. The images by ALMA (Atacama Large Millimeter/sub millimeter Array) revealed in detail the views of two disks of star- forming gas. The disks, as revealed by the images, show two huge heaps (clouds) of gases that are collapsing in influence of its gravitational pull, which are also the hubs of star formation. But the researchers are still unclear how COSMOS-AzTEC-1 has piled up such a huge amount of star forming materials. Probably, after Big Bang something did happen which stocked up these materials. Future telescopic endeavors planned in 2021 might give some clue about the origin and details about the galaxy.